As you may have seen from my previous tutorials and case studies , Java Heap Space OutOfMemoryError problems can be complex to pinpoint and resolve. One of the common problems I have observed from Java EE production systems is OutOfMemoryError: unable to create new native thread; error thrown when the HotSpot JVM is unable to further create a new Java thread. This article will revisit this HotSpot VM error and provide you with recommendations and resolution strategies. If you are not familiar with the HotSpot JVM, I first recommend that you look at a high level view of its internal HotSpot JVM memory spaces. This knowledge is important in order for you to understand OutOfMemoryError problems related to the native (C-Heap) memory space. OutOfMemoryError: unable to create new native thread – what is it? Let’s start with a basic explanation. This HotSpot JVM error is thrown when the internal JVM native code is unable to create a new Java thread. More precisely, it means that the JVM native code was unable to create a new “native” thread from the OS (Solaris, Linux, MAC, Windows...). HotSpot JVM: 32-bit or 64-bit? Before you go any further in the analysis, one fundamental fact that you must determine from your Java or Java EE environment is which version of HotSpot VM you are using e.g. 32-bit or 64-bit. A 32-bit JVM process is in theory allowed to grow up to 4 GB (even much lower on some older 32-bit Windows versions). As you can see, if you allocate a large Java Heap (2 GB+) for a 32-bit JVM process, the native memory space capacity will be reduced automatically, opening the door for JVM native memory allocation failures. For a 64-bit JVM process, your main concern, from a JVM C-Heap perspective, is the capacity and availability of the OS physical, virtual and swap memory. OK great but how does native memory affect Java threads creation? Proper data gathering as per above will allow you to collect the proper data points, allowing you to perform the first level of investigation. The next step will be to look at the possible problem patterns and determine which one is applicable for your problem case. 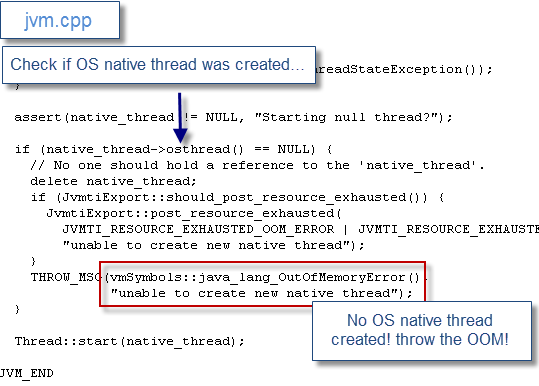 From my experience, OutOfMemoryError: unable to create new native thread is quite common for 32-bit JVM processes. This problem is often observed when too many threads are created vs. C-Heap capacity. JVM Thread Dump analysis and Java process size monitoring will allow you to determine if this is the cause. In this scenario, the OS virtual memory is fully depleted. This could be due to a few 64-bit JVM processes taking lot memory e.g. 10 GB+ and / or other high memory footprint rogue processes. Again, Java process size & OS virtual memory monitoring will allow you to determine if this is the cause. The third scenario is less frequent but can still be observed. The diagnostic can be a bit more complex but the key analysis point will be to determine which processes are causing a full OS virtual memory depletion. Your 32-bit JVM processes could be either the source or the victim such as rogue processes using most of the OS virtual memory and preventing your 32-bit JVM processes to reserve more native memory for its thread creation process. Please note that this problem can also manifest itself as a full JVM crash (as per below sample) when running out of OS virtual memory or swap space on Solaris. Native memory depletion: symptom or root cause? You now understand your problem and know which problem pattern you are dealing with. You are now ready to provide recommendations to address the problem…are you? Your work is not done yet, please keep in mind that this JVM OOM event is often just a “symptom” of the actual root cause of the problem. The root cause is typically much deeper so before providing recommendations to your client I recommend that you really perform deeper analysis. The last thing you want to do is to simply address and mask the symptoms. Solutions such as increasing OS physical / virtual memory or upgrading all your JVM processes to 64-bit should only be considered once you have a good view on the root cause and production environment capacity requirements. The next fundamental question to answer is how many threads were active at the time of the OutOfMemoryError? In my experience with Java EE production systems, the most common root cause is actually the application and / or Java EE container attempting to create too many threads at a given time when facing non happy paths such as thread stuck in a remote IO call, thread race conditions etc. In this scenario, the Java EE container can start creating too many threads when attempting to honour incoming client requests, leading to increase pressure point on the C-Heap and native memory allocation. Bottom line, before blaming the JVM, please perform your due diligence and determine if you are dealing with an application or Java EE container thread tuning problem as the root cause. Once you understand and address the root cause (source of thread creations), you can then work on tuning your JVM and OS memory capacity in order to make it more fault tolerant and better “survive” these sudden thread surge scenarios. As you may have seen from my past article on the Top 10 Causes of Java EE Enterprise Performance Problems , lack of capacity planning analysis is often the source of the problem. Any comprehensive load and performance testing exercise should also properly determine the Java EE container threads, JVM & OS native memory requirement for your production environment; including impact measurements of "non-happy" paths. This approach will allow your production environment to stay away from this type of problem and lead to better system scalability and stability in the long run. Please provide any comment and share your experience with JVM native thread troubleshooting.